Mumbai, India, September 12, 2018 - Industry experts are of the opinion that hetnet and Small Cells are important for Telcos in digitally driven twenty first economy. 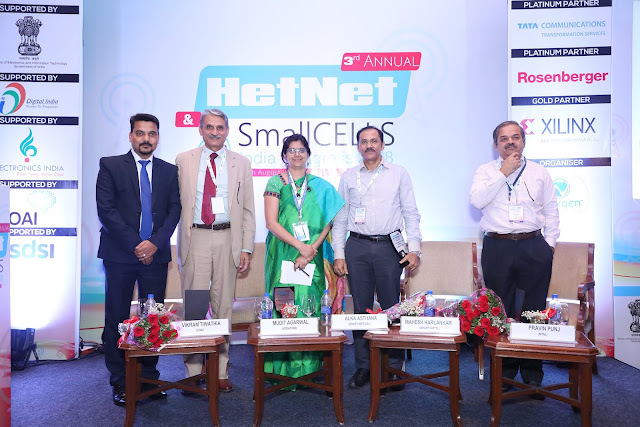 Telecom Industry Experts were discussing about the important of hetnet and small cells during the third edition of ‘HetNet & Small Cells Congress’, a day-long international conference which was organized by Nexgen Conferences, one of India’s leading conferences & B2B event organizers. The day-long congress was held at Taj Lands End, Mumbai in Mumbai. The key telecom industry conference brought together telcos, thought leaders, analysts, and professionals from well-known organizations across the ICT industry. The conference also provided an opportunity for participants to discuss, and explore cutting edge technology solutions to deploy heterogeneous networks and small cells to ensure seamless and secure end-to-end network connectivity for customers in the 4G & 5G era. The conference laid emphasis on the importance of confluence of small cells and heterogeneous networks in driving the Network evolution towards HetNet. As per a Telecom Regulatory Authority of India report of May 2017, there are 1,180.82 million wireless subscribers. According to TRAI data, the total number of broadband subscribers in the country at the end of May 2017 was 291.61 million. Of this, access through mobile devices accounted for nearly 273.38 million. With the growing number of smartphone users, the demand for high-speed internet connectivity and seamless network is going to increase exponentially over the next few years. The congress was supported by well-known organizations such as Tata Communications Transformation Services (TCTS), Rosenberger, Xilinx, COAI, TSDSI, Electronics India, Ministry of Electronics & Information Technology - Government of India, and Digital India.